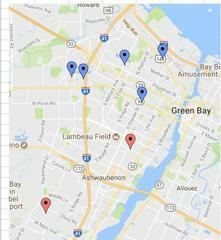 The Green Bay Police Department Crime Analysis Unit has identified a crime pattern on the west side of the Green Bay and into Ashwaubenon. Since February 19th, there have been five reports of catalytic converters being stolen off of vehicles in Green Bay and two in Ashwaubenon. We want to bring awareness to these thefts so all businesses and residents can be on alert for suspicious people. Officers and investigators are following up on these thefts and are working with scrap metal businesses statewide to locate the people responsible for these thefts. •	Be a good neighbor, friend, resident, and be on the lookout. Together we will catch the suspect(s) responsible for these thefts. If anyone has information pertaining to these thefts, please call the Green Bay Police Department at (920) 448-3208. You can remain anonymous and may be eligible for a reward by contacting Green Bay Area Crime Stoppers by phone at (920) 432-7867, through their website at 432stop.com, or by downloading the P3 app through Google play or App store.